Please carefully read this agreement (“agreement”) before accessing or using this Internet Web site (“website”). When you access or use the website, you are agreeing to be bound by this agreement, including the liability disclaimers contained below. If you do not agree to the terms contained herein, do not use this website or download any information from it. Materials on this website may be accessed, downloaded and printed only for personal and non-commercial use. By using this website, you agree that you will not use any materials or information found on this website for any purpose that is unlawful or prohibited by this agreement, including, but not limited to, the use of this website from locations outside of the United States of America or if you are under 18 years of age. Your permission to use the website is automatically terminated if you violate any of the terms contained in this agreement. The contents of CE4RT.COM are owned and copyrighted by XRC LLC, DBA CE4RT and are protected by the laws of the United States, its treaty countries and other jurisdictions. All rights are reserved and no reproduction, distribution, or transmission of the copyrighted materials at this website is permitted without the written permission of CE4RT. All trademarks, logos and service marks are the property of CE4RT. Although CE4RT earnestly attempts to keep the information on its website current and accurate, there may occasionally be typographical errors or inaccuracies that may render the information incomplete, outdated, or incorrect. Please note that such errors, inaccuracies or omissions may relate to product descriptions, pricing and/or availability. Images of courseware are representations of the product only. The actual product of a course consists of electronic media and not actual books, boxes, or physical inventory. The content of this website, including all text, graphics, logos, arrangement, presentations, button icons, images, audio clips, digital download, data compilations and software is the property of CE4RT. Unauthorized use, in whole or in part, of these materials, including reproduction, copying, transmission, distribution, preparation of derivative works, public performance and public display, is prohibited by the Copyright Act of 1976 and other laws. Notwithstanding the foregoing, you as the viewer or user of this website, are granted a nonexclusive, nontransferable, limited license to view, reproduce, print and share materials retrieved from the site provided that (a) such materials are used for personal, informational and/or non-commercial purposes only, and (b) you do not remove, alter, obscure or otherwise eliminate from hardcopy versions the applicable copyright and other notices. 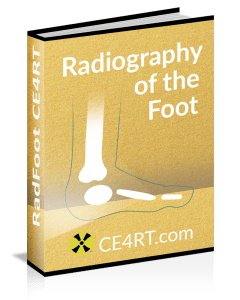 CE4RT, X-Ray College, XRAYCERT, XRC LLC and all related trademarks are the property of CE4RT. CE4RT names and trademarks may not be used by third parties without specific written permission from CE4RT.COM. Other trademarks, service marks, and trade names used in the CE4RT.COM web space are the property of their respective owners. Visitors are welcomed to send communications to us and submit suggestions, ideas, comments, questions, or other information, so long as the content is not illegal, obscene, threatening, defamatory, invasive of privacy, an infringement of intellectual property rights or otherwise injurious to third parties, or objectionable and does not consist of or contain software viruses, political campaigning, commercial solicitation, chain letters, mass mailings, or any form of “spam”. You may not use a false e-mail address, impersonate any person on entity, or otherwise mislead as to the origin of content. CE4RT.COM reserves the right, but not the obligation, to remove or edit this content. If you do post any communication to the website, and unless we indicate otherwise, you grant to CE4RT a royalty-free, perpetual, irrevocable, worldwide nonexclusive license to use, reproduce, modify, publish, edit, translate, distribute, perform and display the communication in whole or in part, alone, or as part of other works in any forum, media or technology, whether known now or hereafter developed, and to sublicense such rights through multiple tiers of sub licensees. CE4RT does not represent or guarantee the truthfulness, accuracy, reliability, or non-infringing nature of any communication posted by other users, nor does it endorse any opinions expressed by you or any other users. You acknowledge that any reliance on material posted by other users will be at your own risk. CE4RT.COM does not screen communications in advance and is not responsible for screening or monitoring materials posted by you or other users. Links from a web site located on CE4RT.COM to any other site do not imply CE4RT endorsement of the site’s products or services. References to non-CE4RT.COM products, services, or organizations do not imply endorsement of such products, services, or organizations. TO THE FULLEST EXTEND PERMITTED BY LAW, CE4RT.COM DISCLAIMS ALL WARRANTIES, EXPRESS, IMPLIED AND/OR STATUTORY INCLUDING WITHOUT LIMITATION, IMPLIED WARRANTIES AND MERCHANTABILITY, NON-INFRINGEMENT OF THIRD PARTY RIGHTS, AND FITNESS FOR A PARTICULAR PURPOSE. CE4RT.COM IS NOT LIABLE FOR ANY DIRECT, INDIRECT, SPECIAL, PUNITIVE, INCIDENTAL OR CONSEQUENTIAL DAMAGES CAUSED BY THE USE OF THIS WEB SITE AND/OR THE CONTENT LOCATED THEREON, WHETHER RESULTING IN WHOLE OR IN PART, FROM BREACH OF CONTRACT, TORTIOUS CONDUCT, NEGLIGENCE, STRICT LIABILITY OR ANY OTHER CAUSE OF ACTION. BECAUSE SOME JURISDICTIONS DO NOT ALLOW THE EXCLUSION OF IMPLIED WARRANTIES, THE ABOVE EXCLUSION MAY NOT APPLY TO YOU. The information on this site, in courses or otherwise presented by CE4RT is in no way to be used as a clinical reference or as legal or medical advice. The specifics of care for individual patients and the practice of medical procedures should only be determined by a qualified ordering physician. The user is responsible for verifying the accuracy and safety of content on this site through other references and by order of a physician. CE4RT WILL NOT BE LIABLE FOR ANY DAMAGES OF ANY KIND ARISING FROM THE USE OF THIS SITE INCLUDING, BUT NOT LIMITED TO DIRECT, INDIRECT, INCIDENTAL, PUNITIVE, AND CONSEQUENTIAL DAMAGES INCLUDING THE APPLICATION OF INFORMATION CONTAINED ON THIS SITE IN A MEDICAL SETTING. The liability of CE4RT shall be limited to the dollar amount paid to CE4RT by the customer for services. CE4RT will not be responsible for any additional costs incurred by the customer for any reason. Any dispute relating in any way to your visit to our website shall be submitted to confidential arbitration in Santa Ana, Nevada, except that, to the extent you have in any manner violated or threatened to violate CE4RT intellectual property rights, we may seek injunctive or other appropriate relief in a state or federal court in the state of Nevada, and you consent to exclusive subject matter and personal jurisdiction and venue in such courts. Arbitration under this agreement shall be conducted under the applicable rules then prevailing of the American Arbitration Association. The arbitrator’s award shall be binding and may be entered as a judgment in any court of competent jurisdiction. To the fullest extent permitted by applicable law, no arbitration under this agreement shall be joined to an arbitration involving any other parties subject to this agreement, whether through class arbitration proceedings or otherwise.